Summary: On my fourteenth birthday when the sakura was in full bloom, the men came to kill us. We saw them come, Aimi and me. We were excited, because we did not know how to be frightened. We had never seen soldiers before. 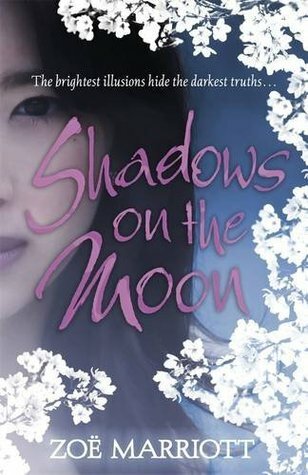 Review: I went into Shadows of the Moon expecting a revenge-thriller-with-magic-and-Cinderella-elements set in a Japanese-inspired fantasy world…and I only sort of got what I wanted. When I sit down for a tale of revenge, I expect that a good portion of the work in question will center on planning revenge and the attempts at enacting said revenge. Unfortunately, Suzume/Rin/Yue (hereafter referred to as Heroine because she really does use three different given names over the course of the book) doesn’t actually get around to vocalizing, let alone enacting, the grand revenge scheme hinted at in the summary until page 262. That’s quite the delay considering the slaughter in her father’s house is over by page 16 and Heroine discovers who was behind the slaughter by page 112. Instead, a good portion of the book actually centers on Heroine’s survivor’s guilt, particularly how she deals/doesn’t deal with her mother’s sudden remarriage and other spoiler-ific events. Heroine’s self-destructive attempts at keeping her sanity were actually quite engaging, but it took a long time for her to take control of her own life. I feel as if I spent the first half of the book wishing we could move onto more interesting things, like the revenge. Perhaps my biggest complaint about this book is its magic. I’m not opposed to magic that’s more about the wonder than strict rules—see my love for N. K. Jemisin’s Hundred Thousand Kingdoms series—but I prefer magic that seems consistent. It’s one thing for Heroine to be able to create illusions or hide herself and quite another for her to be able to shape-shift, create matter from nothing, and heal. I could not figure out how those four separate powers went together, and I eventually had to throw up my hands and say I guess I’ll believe it if you really want me to. Heroine also does surprisingly little with her wide array of powers, to the point where in some scenes I wanted to point out other, cleverer things she could be doing with them for the sake of her revenge. The side characters were a lot of fun, particularly Otieno and Akira. Heroine’s budding romance with Otieno was very cute, provided you’re able to roll with the fairytale-style InstaLove. At least the couple got to spend a lot of time together compared to most fairytale romances, despite the complete absence of Otieno from the summary. Akira brought a nice depth to the book with her history, especially as the ultimate enabler of Heroine’s revenge. I’m always pleased to run into adults who support teenage protagonists and allow them to make their own decisions—even if they don’t agree with those decisions. Recommendation: Borrow it someday. Shadows on the Moon needed 100 fewer pages spent on being passive, confused, and/or powerless and 100 more pages on revenge, plot twists, and moral quandaries. A few people recommended this book to me. But I think the long wait for the revenge story would be frustrating.